Welcome to the Fascinating Subject of Sewage Disposal. I.H.S. SYSTEMS LTD. of Kidlington, Oxford, specialise in the supply, installation, and maintenance of equipment to purify and dispose of sewage, wastewater, and commercial effluent, in a manner which complies with Environment Agency Standards. 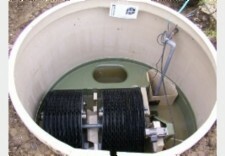 This service is particularly useful in rural areas where main drainage does not exist, or where connection to a main sewer is not possible. As a Klargester Approved company we install and maintain their range of equipment to serve any application, from a single family dwelling to a complete town, village, or commercial complex. No chemicals or additives are used for the treatment of domestic sewage effluent. Your environment is not poisoned or polluted by the purification process. Our equipment relies on digestion of waste products by naturally occuring ''friendly'' bacteria. If a main sewer is available within a few miles of the property to be served, we offer a design and installation service for pipelines and pumping equipment. I.H.S. Systems Ltd. provide a range of services including consultancy, planning, installation, maintenance, overhaul, and repair of all makes of sewage equipment. We can also deal with any official paperwork on your behalf. Our other web pages show some of the history of sewage treatment; problems that can occur, and why; and a selection of treatment units, with pros and cons. and a review of other services offered by I.H.S Systems Ltd. For a no obligation chat about your sewage or water related problems, call our central number 01865 376644 for free advice, or use our e-mail contact page. As civil engineers we offer a complete water related engineering service. This covers anything and everything where water is involved, from potable water supply and rainwater harvesting to lake construction; purpose designed flood defences; supply and installation of hydro-electric power plants; and most other things you can think of. The first few pages deal with sewage and how to dispose of it. The rest give some examples of our other activities. Check through the headings and sub-headings at the top of this page. I. H. S. SYSTEMS LTD.
© Copyright 2019 - I. H. S. SYSTEMS LTD.